On our last blogpost, we have announced the winners of the March wagering contest. The April wagering contest so far has been a blast! Users are fighting fiercely to reach the top position and secure their rewards. Easter is coming soon, and we might have a small surprise for our users! Within this one week, we have seen multiple awestruck bets and users making huge profit. So far, the April wagering contest has been quite a buzz. Once again, we can see our old winners conquering the wagering contest leader board of this month. Talking about the leader board, we have added a new column called “24h Change” where we can see the changes in users position within the last 24 hours. This is going to be helpful for users to keep track of their position. A brief summary of the wagering contest leader board is given below. Bitcoin: User Sceobba658 can be seen on top of the wagering contest leader board. The user has wagered a total of 93.85 BTC and will receive an estimate reward of 0.206 BTC out of the maximum reward of 1 BTC if the user manages to hold his position. Second place is taken by xkip who has wagered a total of 64.9 BTC and will receive an estimate of 0.1233 BTC out of the maximum of 6 BTC as a reward. Third place is taken by treebeard who has wagered a total of 24.59 BTC and will receive an estimate of 0.039 BTC as a reward out of the maximum of 0.3 BTC for his achievements. Bitcoincash: User Codie251 is currently holding the top position of bitcoincash wagering contest leader board. The user has so far wagered 210.28 BCH to reach this position and will receive an estimate of 0.42 BCH out of the maximum of 6 BCH as a reward. Second place is taken by Cuelino478 who has wagered a total of 67.597 BCH and will receive an estimate of 0.121 BCH as a reward out of the maximum reward of 4 BCH. The third place is currently taken by juan who has wagered 48.1 BCH. Based on his current achievements the user will receive an estimate of 0.072 BCH out of the maximum of 2 BCH as a reward. DASH: The top position of Dash wagering contest leader board is currently captured by Kelsie080 who has wagered a total of 18.18 DASH to reach this position. The user will receive an estimate of 0.036 DASH out of the maximum of 5 DASH as a reward. The second place is currently occupied by szkibak who has wagered a total of 14.4 DASH and will receive an estimate of 0.025 DASH out of the maximum of 3 DASH as a reward. The third place is occupied by VorkaDE who has wagered a total of 9.78 DASH and will receive an estimate of 0.0146 DASH out of the maximum of 1.5 DASH as a reward. Dogecoin: User Clevon839 can be currently seen on the top of the Doge wagering contest leader board. The user has wagered a total of 19,892,414 DOGE for now and will receive an estimate of 39,784 DOGE out of the maximum of 300,000 DOGE. The second position is taken by born2winz who has wagered a total of 7,496,765 DOGE and will receive an estimate of 13,494 DOGE as a reward for his current achievements. The third position is taken by tum8716 who reached this position by beating 6 old users within the last 24 hours. The user has wagered a total of 1,969,743 DOGE and will receive an estimate of 2,954 DOGE as a reward out of the maximum of 100,000 DOGE. Ethereumclassic: User Nima is currently on the first position of the ETC wagering contest leader board. The user has wagered a total of 2,344 ETC to reach this position and will receive an estimate reward of 4.688 ETC out of the maximum of 70 ETC reward. The second place is currently occupied by nova84 who has wagered a total of 448.41 ETC and will receive an estimate reward of 0.8 ETC out of the maximum reward of 40 ETC. The third place is currently on hold by Goobersmooch who has wagered a total of 322.795 ETC to reach this position and will receive an estimate reward of 0.484 ETC out of the maximum reward of 20 ETC. Ethereum: The Ethereum wagering contest top user is Locyn816 who has wagered a total of 1,456 ETH and will receive an estimate reward of 3.2 ETH out of the maximum reward of 5 ETH. The second place is currently taken by Meowy who has wagered a total of 473.855 ETH and will receive an estimate reward of 0.9 ETH out of the maximum reward of 3 ETH. The third position is taken by Jermane821 who has wagered a total of 0.689 ETH estimated reward out of the maximum of 1.5 ETH as a reward. NeoGas: User Exxon can be seen on the top of the NeoGas wagering contest leader board. The user has wagered a total of 3,557 GAS and will receive an estimate reward of 7.11 GAS out of the maximum of 100 GAS reward. The second place is taken by LoliPhabay who has wagered a total of 147.87 GAS to reach this position and will receive an estimate reward of 0.266 GAS out of the maximum of 60 GAS as a reward. The third place is occupied by PorRoo who has wagered a total of 130.376 GAS and will receive an estimate reward of 0.1955 GAS out of the maximum reward of 30 GAS. Litecoin: The Litecoin wagering contest is currently being led by fatgooseNNA who can be seen on the top of the leader board. The user has wagered a total of 411.9 LTC and will receive an estimate reward of 0.82 LTC out of the maximum reward of 15 LTC. The second position is taken by Roberto311 who has wagered a total of 178.092 LTC and will receive an estimate reward of 0.32 LTC out of the maximum reward of 10 LTC. The third position is taken by Bradd111 who has wagered a total of 48.143 LTC to reach this position and will receive an estimate reward of 0.0722 LTC out of the maximum reward of 5 LTC. Peercoin: The user Claudio513 can be seen on the top of the Peercoin wagering contest leader board. The user wagered a total of 33,409 PPC and will receive an estimate reward of 66.81 PPC out of the maximum reward of 500 PPC. The second place is occupied by DemiGod who has wagered a total of 8,047 PPC and will receive an estimate reward of 14.48 PPC out of the maximum reward of 300 PPC for her achievements. The third position is taken by Skyelar who has wagered a total of 6,050 PPC and will receive an estimate reward of 9.076 PPC out of the maximum reward of 150 PPC if the user manages to hold his position. STRATIS: User Dimagog has currently occupied the top position of the STRATIS wagering contest leader board. The user has wagered a total of 8,430 STRAT and will receive an estimate reward of 16.86 STRAT out of the maximum of 400 STRAT as a reward. The second position is taken by Smitty337 who has wagered a total of 3,585 STRAT and will receive an estimate reward of 6.45 STRAT out of the maximum reward of 250 STRAT. The third position is taken by ESHManny who has wagered a total of 3,083 STRAT and will receive an estimate reward of 4.625 STRAT out of the maximum reward of 125 STRAT. Monero: The Monero wagering contest is currently being led by Itibor who is at the top position by wagering a total of 196.93 XMR and will receive an estimate reward of 0.393 XMR out of the maximum reward of 8 XMR. The second position is occupied by Arccotangent who has wagered a total of 156.822 XMR and will receive an estimate reward of 0.2822 XMR out of the maximum reward of 5 XMR. The third position is taken by Linzee391 who has wagered a total of 25.8 XMR and will receive an estimate reward of 0.0387 XMR out of the maximum reward of 2.5 XMR for his current achievements. Less than 19 days left before the April wagering contest comes to an end. But you still have a chance to stand out during the no bet delay promotion. Keep in mind, the no bet delay starts on every Monday and lasts for 24 hours straight! Just hop in and give your best to get into the top position and grab some sweet rewards! No new jackpot has been hit. We have seen the last bitcoin jackpot being hit by Shahista on 7th of March. We hope to see a jackpot being hit soon enough. Once again, we would like to remind you that the jackpot rules have been changed. More information on how to win the jackpot and claim 100% of the reward can be found at the “Jackpot” section in FAQ. If you still have questions about the jackpot, feel free to ask us on the chat channel. Bitcoin Lotto Round 359 has been won by Sceobba658 (1st place with a win chance of 17.498 %), treebeard (2nd place with a win chance of 3.50 % only!) and Crypt0Knight (3rd place with a win chance of 1.137 %). Each user won a total of 0.09144 BTC, 0.017145 BTC and 0.005715 BTC according to their respective position. Bitcoin Lotto Round 360 has been won by sator (1st, 2nd and 3rd position with a win chance of 25.316 %) winning 0.006320 BTC, 0.001185 BTC and 0.000395 BTC for each position. 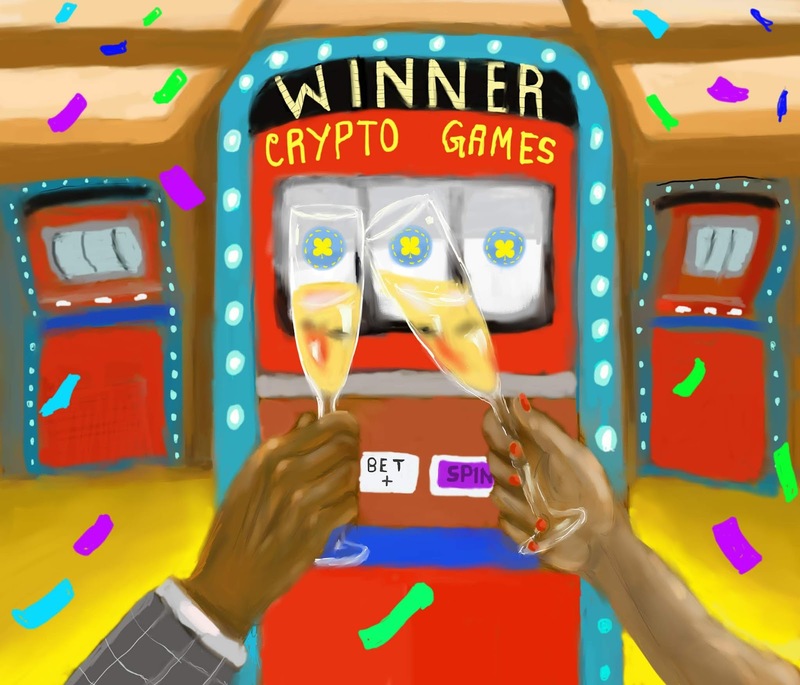 Ethereum Lotto Round 149 has been won by Aylmer555 (1st place with a win chance of 30.060 %), Jermane821 (with a win chance of 20.040 %) and s0lidus (3rd place with a win chance of 6.313 %). Each user has won 1.1976 ETH, 0.2245 ETH and 0.0748 ETH according to their respective position. Litecoin Lotto Round 91 has been won by Roberto311 (1st place with a win chance of 24.311 %), Skyelar (2nd place with a win chane of 31.848 %) and Jok354(3rd place with a win chance of 16.207 %). Each user has won a total of 04.936 LTC, 0.925 LTC and 0.308 LTC respectively. Doge Coin Lotto Round 180 has been won by Juan (1st place with a win chance of 24.311 %), Oger469 (2nd place with a win chance of 6.483 %) and Skyelar (3rd place with a win chance of 31.118 %). Each user won 98,729 Doge, 18,510 Doge and 6,170 Doge according to their respective position. User euganhei made a profit of 0.044992 BTC (Dice BetID: 3,389,058,222) by wagering only 6400 satoshi. The user managed to hit the x704 multiplier! User fatgooseNNA made a profit of 3.7 LTC (Dice BetID: 3,386,011,962) by making a risky wager of 11.47 LTC. User WhiteWolf made a profit of 0.103 BTC at Video Poker (Video Poker BetID: 5,403,373) by wagering only 0.0015 BTC! User PorRoo made a profit of 2.4576 ETH on Roulette (Roulette BetID: 12,948,401) by wagering 4.9152 ETH. User Ovoroman made a profit of 0.4 ETH on Black Jack (Black Jack BetID: 5,702,763) by winning the hand! Once again user WhiteWolf made a profit of 0.01856 on plinko (Plink BetID: 8,467,085) by wagering only 64k satoshi! User Aguisel935 made a profit of 0.7 ETH (Roulette BetID: 13,101,836) on roulette by spinning a zero and wagering only 0.02 ETH! The same user made another profit of 0.525 ETH by wagering only 0.015 ETH and spinning another zero! April wagering contest has less than 19 days before it comes to an end. Don’t worry, you still have enough time to join this month’s wagering contest. Join the April’s wagering contest right away. Don’t forget about the Monday’s which can be a huge advantage for users to reach the top of wagering contest leader board. Keep in mind, there are coins that are not much active in the wagering contest which you can join and easily reach the top position. If you have any suggestions or wish to leave a feedback, don’t hesitate to contact us through email or the directly through the chat! Easter is coming soon, and we might have a surprise for you! Keep an eye on your email for more information!